Honestly, I had never thought about it. Before reading Barbara Katz Rothman's new book A Bun in the Oven: How the Food and Birth Movements Resist Industrialization, I had not noticed the parallels between the widespread and more or less organized efforts to change the way we eat and the way we are born, two among the most fundamental experiences in human life. Personally, I have qualms with describing what's happening in the food world as one movement. I am not familiar with the birthing milieu, but in the case of food I see a shifting assortment of groups with distinct ideals, values, goals, and priorities, which also reflect in different political and social strategies. Mostly emerging from civil societies, this complex ensemble emphasizes issues as diverse as the defense of natural environments, fair trade, opposition to GMOs, local agency, connection between farmers and consumers, food justice, food safety, artisanship, and communal enjoyment of meals. These concerns are deeply connected, as the focus of the international association Slow Food on "good, clean, and fair" food indicates. Although the organizations embracing those problems are slowly developing a common language, their activities and campaigns are often uncoordinated, which at times dampens their opportunities for effective political lobbying at the local and national levels. However, a common theme that seems to sustain most of these efforts is the urgency to change the food systems, experienced as unjust, unhealthy, and unsustainable. As Katz Rothman points out, all these groups are trying to question the process towards industrialization that, at least in the US, began in the nineteenth century. Consumers have lost direct contact with the source of their food, while mechanization and concentration of production moves food into the realm of technological and scientific expertise, excluding citizens from important decision processes. The author suggests that similar changes have also taken place in birth, in which midwives were marginalized and excluded from the modern space of hospitals: "In vague generalities, one could talk about how birthing and cooking were women's work that men took over, applied a scientific lens to, and moved to the realm of industrial capitalism... Industrial birth is managed no more in the interest of birthing women and babies than industrial food is managed in the interests of its consumers." In fact, she argues, "The American story is less about physician control, and more about the move to hospitals, the removal of birth from the lives and the spaces of women and families, and into the world of institutional management." Katz Rothman observes that it is a "sad tale of rich white men running over women, and especially poor women of color" and immigrants, with their traditions and their hands-on wisdom that was transmitted from woman to woman through shared practice. She also points out how women "fought hard for the convenience of the scientific model promised," such as epidurals and hospitalization, the same way women in the 1970s were trying to escape the kitchen, a place of toil and exploitation. Both in food and birth, a reversal seems to be taking place, with a renewed appreciation for more individualized, localized, and emotionally rich experiences. The accusation of elitism has been leveled against the birth and food movements, as limited to people who have the financial and cultural capital, as well as the political voice, to select among different options. Rachel Laudan famously offered a critique of this attitude in food choices as "culinary luddism," observing that the availability of accessible and affordable food is not always and necessarily an evil to fight against. 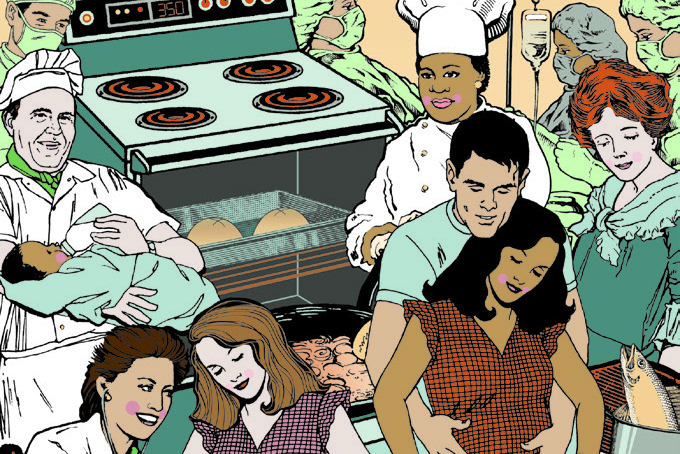 However, according to Katz Rothman, birth and food movements are to be appreciated as "meaning-seeking," since they strive to break free from the "increasing homogenization of American culture." A Bun in the Oven is an intriguing, often startling reading, especially if you have never given much consideration to birth and all that implies. It is also a very personal and moving account, in which the author shares episodes of her own life, her reflections on death, life, and suffering, as well as more general considerations about authority, gender, and power. Not your usual summer reading, but a satisfying one.